We should have 125 in stock. Need more? It usually takes us 2 - 4 weeks to bring more in. New England Ropes' Stage-Set X is the softest, strongest and most environmentally stable product available in the theater industry for counterweight systems. 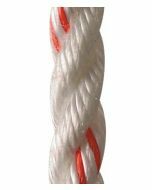 Its parallel core of polyester fiber contained within a helically wrapped polyester tape and covered by a braided polyester jacket, remains firm and round under all load conditions and resists crushing in rope locks. 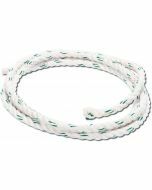 A premium, high strength replacement for manila and other ropes used backstage. White color. 18" x 18" x 0.08"